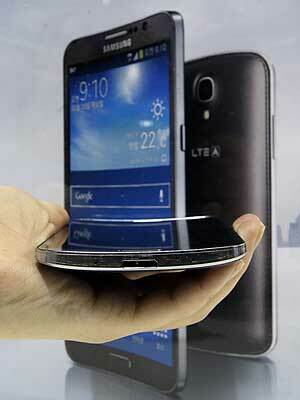 Priced at $1,000,Samsung Galaxy Round's display has a horizontal curve,weighs less than Note 3. Samsung Electronics Co Ltd on Wednesday launched the world’s first smartphone with a curved display,the Samsung Galaxy Round,a variant of the Galaxy Note which moves the Asian giant a step closer to achieving wearable devices with flexible – even unbreakable – screens. Curved displays are on the frontlines of Samsung’s innovation war with rivals such as Apple Inc and LG Electronics Inc,as the South Korean firm seeks to expand its lead in the slowing market for high-end smartphones. “It’s a step forward for having unbreakable gadgets and flexible devices eventually. But for now,the new phone is more of a symbolic product,” said Hana Daetoo Securities analyst Nam Dae-jong,adding that Samsung did not yet have capacity for large-scale production of curved touch-screens for the new Galaxy Round. The Galaxy Round is Samsung’s attempt to gauge consumer appetite for curved phones although its lack of other eye-catching features means it is unlikely to be a hit,he said. “I don’t think it’ll be massively compelling enough for gadget buyers as… the curved display doesn’t come with many unique features,” he said. The Galaxy Round’s 5.7-inch (14.4-centimetre) display has a slight horizontal curve and weighs less than the Galaxy Note 3,allowing a more comfortable grip than other flat-screen models on the market,Samsung said in a statement. Its key features include a tilt function which allows users to check information such as missed calls and battery life,even when the home screen is off. Users can also scroll through media files by pressing the screen’s right or left,the company said. Curved displays open up possibilities for bendable designs that could eventually transform the high-end smartphone market,where growth has slowed amid competition from low-end producers. Samsung’s Galaxy Gear smartwatch released last month has a flat screen,but the company is hoping to have the technology to make more attractive and wearable devices in what is shaping as a key battleground for consumer electronics companies. Technology firms have yet to figure out how to cheaply mass produce the parts and come up with display panels that can be thin and heat-resistant. Batteries also have to take new forms to support flexible screens that can be rolled out,attached to uneven surfaces or even stretched. The battery in the Galaxy Round is not curved,Samsung said. Competition is heating up with Samsung’s cross-town rival LG Electronics planning to introduce a smartphone with a vertically curved display in the first week of November,a source familiar with the matter said this week. Its components affiliate,LG Chem Ltd,said on Tuesday it had started commercial production of a curved battery for use in the device. The firm also said it has developed a battery in cable form,suitable for wearable devices,and expected to start commercial production within the next couple of years. Technology analysts and media reports say Apple is working on a smartwatch,potentially with a curved screen,but there has been no word from the California-based company about its plans. Samsung’s new curved-screen phone,available through South Korea’s biggest mobile carrier SK Telecom Co Ltd,costs 1.089 million won. 2 Martian clouds float on Earth!